The 35th Rhubarb Festival in partnership with the Canadian Lesbian & Gay Archives. 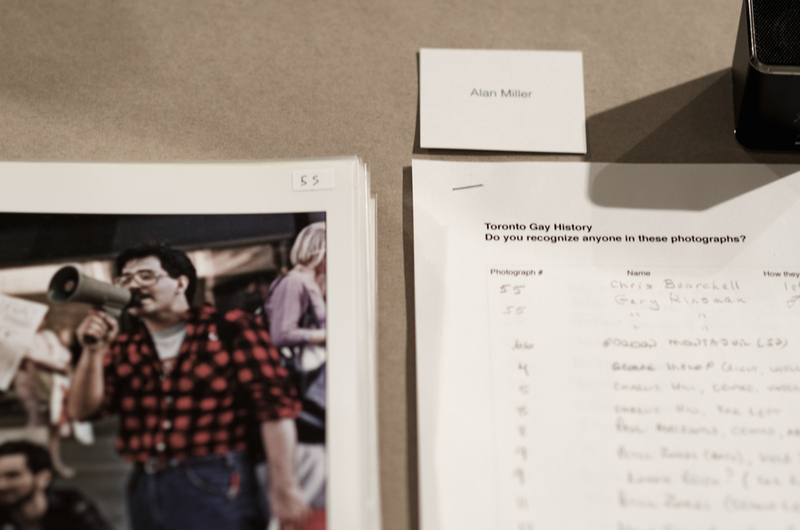 Listening at the CLGA was an exhibition and community audio broadcast, made in collaboration with the Canadian Lesbian & Gay Archives (CLGA) and presented as part of the 35th Rhubarb Festival in Toronto. Seeking to re-engage with an important history of local activisms and examine audio as a medium for embodied archives the project initiated a 24 hour online broadcast of a (mostly) forgotten collection of cassette tapes from the CLGA back into the community of which it documents. In conjunction with this broadcast a neighbourhood wide listening event was organized across a variety of public sites in the community (on the sidewalk, in a community centre, at starbucks, bars, a bookshop). 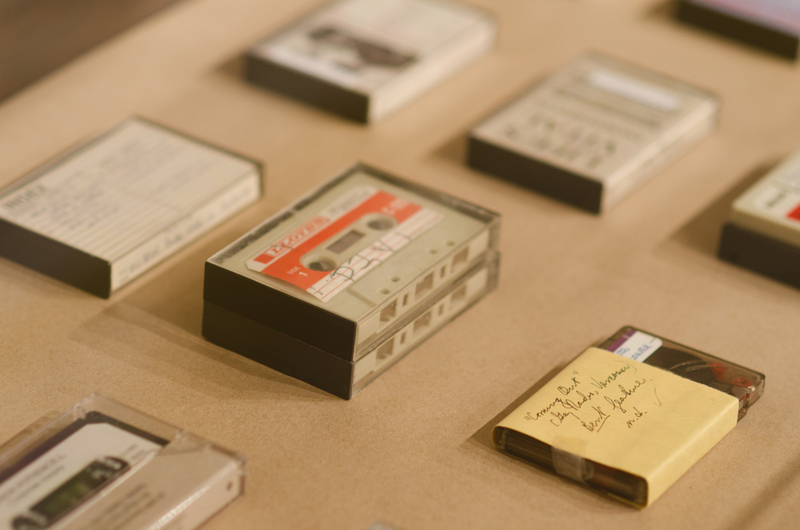 An exhibition of the cassette tapes, accompanied by an audio guide featuring of prominent community voices responding to their own encounters with the recordings, was shown at the archives as well. Since 1973 the Canadian Lesbian & Gay Archives has been collecting audio recordings of all manner. Interviews, music, radio shows, police meetings, protests, and home recordings have been donated by both individuals and institutions. The Archives has more than 2,000 hours of sound on tape documenting the voices that shaped the LGBTQ community today. 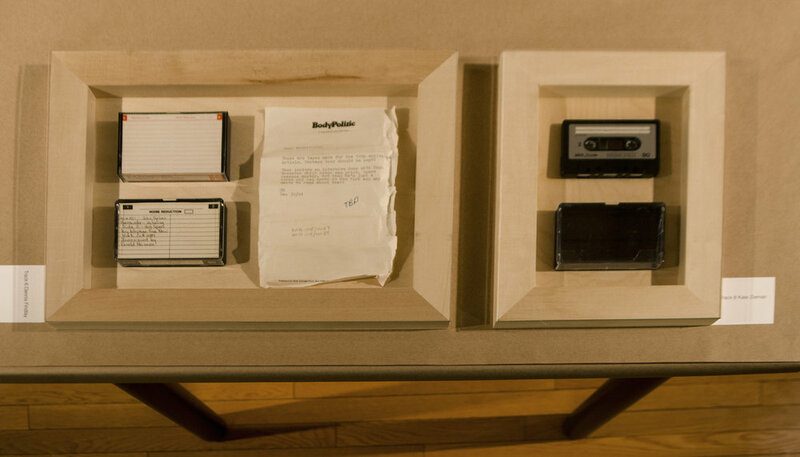 The project focused on several boxes of undocumented cassettes found within the CLGArchives which dated back to the earliest years of the CLGArchives history. The cassette tape, which perhaps historically was the first truly ubiquitous format for personal recording (and sharing), seems a place where the personal can still be found, yet none the less can still end up being forgotten. Many of the tapes were accompanied with hand written notes providing the only clues to their contents. Each tape held a story from its donor - some well known figures in the community and others not. The archive in general is a place where things inevitably get left out. Collection policies which are inclusive in philosophy are met with significant challenges in managing large amounts of physical material. Within diverse collections that span the highly personal to the institutional it is the small, the personal, the unknown, and uncategorized items which get left behind, as opposed those materials which have greater institutional association. This project considers the activity of listening, together and alone, as a performative: an opportunity to reengage with, and building on sonic/oral histories.